A Call for Environmental Art. 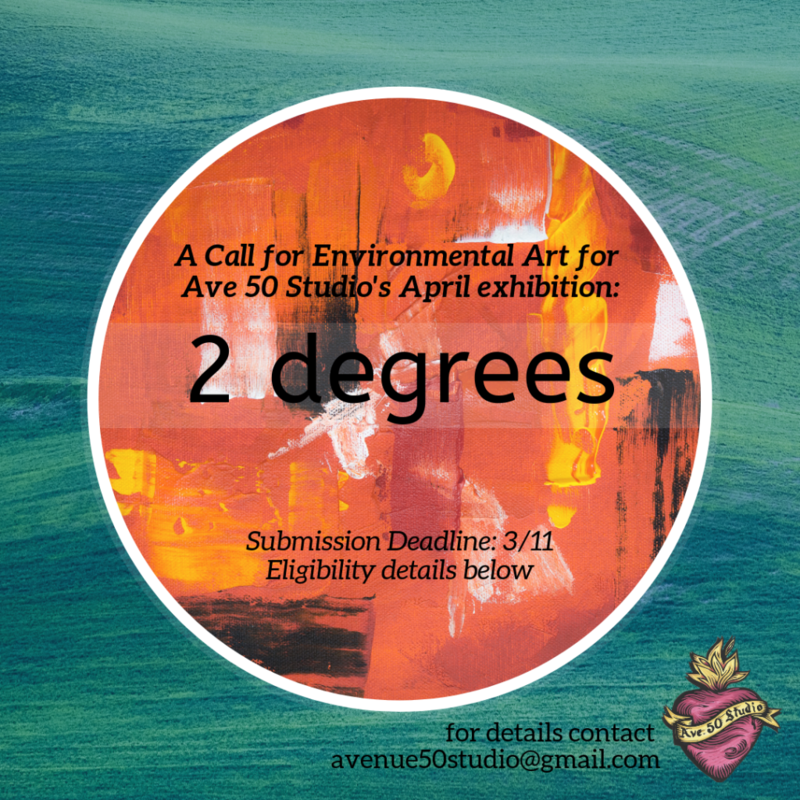 Avenue 50 Studio is accepting submissions for our April show titled 2 Degrees. Climate experts around the world are warning us about the danger of our Earth’s temperature climbing higher each year. Two degrees Celsius is the number they’ve given us as the point of no return. Scientists expect in a post-2-degree world we would experience an increase in extreme weather; animals and plants will be at a higher risk of extinction; the Arctic will keep melting; crop yields will decrease; and freshwater will decline. Yet, roughly 40% of the population doesn’t believe in climate change, with many of those believing it’s a hoax. What are your thoughts about 2 Degrees? All artwork inspired and/or related to the theme of 2 Degrees will be considered. Open to all artists age 18 and older. All fine arts visual media will be considered. Unfortunately, because of size limitations of gallery no large sculptural pieces. No works over 36” x 48”. Email images to avenue50studio@gmail.com (subject line: 2 Degrees Entry). Include no less than 3 images. Please include an artist statement about the work.